The woeful economy and high fuel prices have done significant damage to the sport of drag racing. 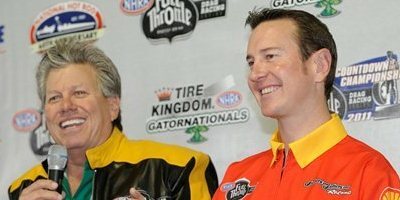 Perhaps a more serious problem for straight-line fans is the aging of top racers in the NHRA, the nation’s premier drag racing sanctioning body. 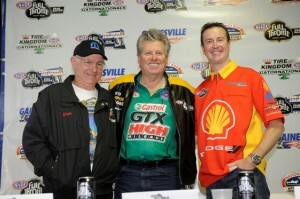 Consider this; the two biggest names in drag racing are “Big Daddy” Don Garlits and John Force. Garlits is 79 and Force is 62. Where are the stars of tomorrow? Many agree the most important measure of a star is the ability to sell tickets. Bring Force to a small eighth-mile track on a Wednesday night, promote it and spectators will fill the stands. What other active racer can make the same claim? Who else is an attraction? The motorcycle ranks are even more anemic when it comes to star power. Does anyone buy a ticket to see any of the Pro Stock Motorcycle racers? Of the 84 drivers entered in NHRA’s Norwalk event this past season, 29 were 41-50, 12 were 51-60, and astonishingly, eight were 60 or over. NASCAR seems to be doing a better job of developing new young stars like Kurt and Kyle Busch, Joey Lagano and Trevor Bayne. When Force finally retires, the NHRA will be faced with an even greater dilemma than the NBA encountered in the late 90’s when its marquee star, Michael Jordan, walked away from the game. NBA ratings, attendance and revenue suffered. However, the NBA had the advantage of a much larger and younger fan base and a huge talent pool to draw potential new stars. Kids aren’t down on the corner practicing their reaction times, they’re shooting hoops. An overwhelming portion of NHRA’s audience is over the age of 50. Advertisers want to see the all-important 18-35 demographic, who spend and drive pop culture. The “Fast and Furious” import scene which flourished in the early 2000s is all but dead. NOPI and NHRA Explode are gone. At nostalgia car shows, older gentlemen stare for hours at iconic and classic vehicles like the Stone Woods and Cook Willys coupe. They reminisce about how they used to build toy models of the vehicle as children. Are any of today’s kids building Spencer Massey or Antron Brown model dragsters? NHRA’s telecasts have to become more gripping and captivating. Aside from Force, nitro racing is NHRA’s greatest attraction. Unfortunately, nitro racing doesn’t carry over well on TV – you can’t feel it, you can’t smell it. The most alarming question is; if NHRA continues to age and decline in popularity, what is the future of the organization and the sport? To survive and prosper, NHRA must find a way to reinvent itself, to somehow generate interest in the sport by young men and women. The NHRA must develop compelling young stars and television shows. What is your solution or take on this dilemma? Leave a comment below. The engines in suzuki prostock bikes are practically antiques w ZERO market relavance. And that class has SUCH political corruption that it seems to be generating as many haters as followers among the informed. Stand back and watch it burn. The NHRA has not kept up with the times. Another problem is that the auto manufacturers are not producing the hot rods we had in the 60s & 70s. I have a suspicion we will see many more outlaw tracks in the future. Goodbye NHRA. Nice take. I don’t think NHRA is in danger of going out of business. I think they will always be the leading drag racing sanction. They still have a strong enough fan base to remain profitable for many years to come. However, I do see NHRA continuing to decline. The younger generation is not embracing the sport. Try a blend at a couple of events and promote it, mix in the crazy 8 and pro street class that mirock runs. And add in a heads up super street car class. The mix of these to will help bring in fans and younger crowds. Quit trying to be nascar they are losing their fan base also. The younger set today want instant everything,that is why dragracing should prevail. NHRA also needs to quit bleeding sponsors also. I feel there are two things that should be looked at to increase the popularity with the younger crowd. First the price of tickets are too expensive for a family to go to a race. Lower the prices, give more away to radio, and tv stations to give out. Look at the fan base of ADRL. I agree that watching it on TV is just not the same. You do not FEEL the action on TV like you do at the track. Once you FEEL the action you are hooked! The second thing I think you could work on, spend coverage on other drivers. If you profile one driver (Force) than that is the driver everyone will know and want to see. I have noticed over the last few years it has become more Force Racing rather than NHRA coverage. I also did not like the drama that was covered this past season and Paul Page needs to go. Hey, NHRA you Greedy dinosaurs… you have done this to yourself! First off its to dam expensive to go to the races, second the rules are more ridiculous and complicated every year.its more of a participation sport anyway. Who wants to watch cars going in a strait line?? after a while it becomes very boring!, that goes for NASCAR too, roundy round left turns.. snooze…kids now days do race… on the streets.In my opinion road racing is much more interesting. The problem really isn’t at the top. Yes, the TV coverage needs an overhaul to make it more exciting and showcasing younger racers will give young people someone to relate to but the problem is deeper than that…You need to find new ways and new classes that will get youngsters (The 18 to 35 demo) into and interested in the sport. A grassroots approach in all of motorsport is LONG overdue…everyone is so intent on accenting the bigtime and pushing it as a spectator sport that the participant aspect is getting lost. Come up with ways to get the younger crowd out to the local strips and the big events will attract more spectators and the stars of the future will emerge…This is especially important in motorcycle drag racing…Why do sports like motocross and offroad racing seem to flourish? Because the AMA (the motorcycle racing equivilent of the NHRA)stresses local grassroots racing for starters! That’s not the entire answer but I’m convinced ita couple of key pieces of the puzzle. The biggest reason their is little grassroots support for motorcycle dragracing or road racing is their is no “feeder system” for young talent. When a ten or twelve or even fourteen year old wants to go motorcycle racing his ONLY choice is motocross. Until we get the young envolved with hands on early experiance we will continue to loose those talented kids to MX or stick and ball sports. I don’t buy the “safety” arguement either. Is it really safer to send that 14 year old over a 90 foot double than send him streight down a piece of smooth asphalt while wrapped in leather? Granted their are more MX tracks in the US than dragstrips but the reason is because of the popularity that has been generated by the fact that anyone no matter how old or young can come and play. The NHRA has Jr. Dragsters why don’t we have the same opportunity (no I don’t mean lawn mower engine powered mini bikes) for aspiring motorcycle racers? Take that KX 85 and make a dragbike out of it………………. Get someone like Clear Channel involved. They are an entertainment organizaton and know how to make motorsports rock. They continue to take Super Cross to new levels. Give suzuki a break! Let them have a billet engine just like the v- twins (ex.dsr billet inline four) . They are running welded up mid80s pourus alum. cast cases.nhra ( lower case cause there getting smaller in content but higher in price) should pay attention to Warren Johnson cause he has been very verbal about all things run on gas. A pro motor can cost up to $200,000. A 1000 ci 4 stage nitrous motor half the size can be had for $125,000. A run of the mill Buell motor $50,000+. Transportation costs are the same, but there is no parody in the championship prize . You can die at 190 mph as well as 330 mph.nhra wake the f**k up! What NHRA needs to do is allow all kids under 12 in for free. Do that and offer free beer for a couple of hours. They could give away a cheap beer like Coors. That way the could offer free beer but nobody would want it.